Located in Henderson 89012, Roma Hills is a Guard Gated Custom Home Community. The public and private schools in the area are top notch, shopping is plentiful, proximity to the airport, about 20 minutes, and 1/2 hour from the Strip. It is located 7 minutes from THE District and the Green Valley Ranch Hotel Casino and Spa with its Movie Theater Complex . At The District you have a ton of shopping and casual dining options. The Multigenerational Center and Henderson Pavilion, and Palos Verde Library are minutes away, as is The M Resort. HOA Dues at Roma Hills is $225 per month. There are about 130 homes in Roma Hills. Roma Hills is nestled between Ascaya, Guard Gated Multi Million Dollar Custom Homesites, and the Dragon Ridge Golf and Country Club. Since all the luxury homes at Roma Hills are custom built, you will see a variety of styles and architecture in the homes showcased below. 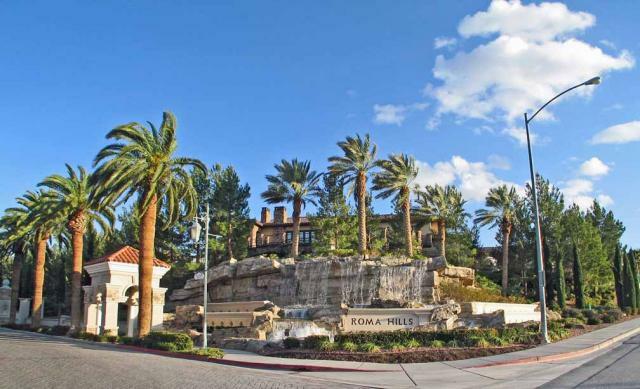 Browse all Roma Hills Custom Homes Listings in Henderson for Sale in the MLS.